If you’re a college student or working professional, you more than likely have an active LinkedIn profile. If you don’t, exit this screen right now, set up an account, and then continue reading below. LinkedIn is such a great tool for networking, job hunting, and keeping a master log of your activities for 260 million monthly active users to see. I love the site because users can include so many activities and details that simply won’t fit on a one-page resume. Regardless of your current field (medicine, art, videography) or your job status, (student, unemployed, retired) LinkedIn can work for you in numerous different ways. However, I see many people using LinkedIn the wrong way. Like very wrong. I often cringe when I see certain content on the site because I wonder why folks think it is acceptable. I honestly wish more universities taught students how to properly network and use the platform beginning at orientation. If you're overdue for updating your LinkedIn page, head over to your profile while reading my guidelines below! My LinkedIn profile photo is from a speaking engagement I had earlier in 2018 and my headline covers a multitude of activities. Get a friend with a nice camera to take a headshot for you and size it 400 x 400 px. No friend with a nice camera? Head to a portrait studio and get a photo taken there. If that’s simply out of your budget, stand in front of a white wall with good lighting and get a friend to snap a photo on their iPhone X. It’s better than a selfie. Wear clothes that match the job you’re trying to achieve in your photo. If you’re looking for a job in the financial industry, a white t-shirt won’t work. Dress for success. Photos that actively display what you do, or want to do, are also acceptable on a case-by-case basis. Shoot me a note if you have a question on this! Make sure your LinkedIn header photo (the image behind your main photo) meets the above guidelines and is relevant, professional, and intriguing. This photo is best sized at 1584 x 396 px. Your LinkedIn headline is extremely important for informing the masses on exactly who you are and what you have to offer. Your LinkedIn headline should not be in all caps. People equate all caps to yelling, and then they simply will not want to connect with you. Do not make your headline a full sentence. Keep it somewhat short, but still informative. Remember that your headline does not have to be your job title. Take a look at my headline in the above photo. It does not specify what my specific role is at any of my companies. Instead, it mentions a few of the different things that I do with keywords that help me come up higher in search. If you are currently searching for a role because you’re unemployed, having a headline that says “Actively seeking employment” is acceptable on LinkedIn. Bonus points if you include the city that you are looking for employment in! But, do not make this your headline if your boss does not know you’re looking for another job. Let employers know exactly what you’re trying to achieve and where you want to live. Bottom line: Your profile should never be bare. Start by adding in your college information, past internships, current role(s) and any volunteer roles. Always add descriptions of what you’ve done at each place of business and make sure they are in past tense if you’re no longer in the role. If you’re a college student, include internships, club memberships, leadership roles, greek involvement, and volunteer opportunities. Do not underestimate any roles you’ve had and be selective with phrases in order to really amp up your tasks. Include media including outside links, photos, and videos to your experience sections to further back up what you are capable of creating. Do not forget to fill in your summary section! That is your space to truly shine and discuss exactly why people should get to know or hire you. Treat it as a mini cover letter and add in unique details that could get buried further down in your profile. Your LinkedIn summary section can also be found on Google! Include information if you’ve been published, any certifications you’ve received, or any patents and awards you may have. Remember: LinkedIn profiles that are 100% complete rank higher in search. Toggle this button when you’re updating your profile but you don’t want people to be alerted via notifications or emails. I can’t tell you how many LinkedIn requests I have from people I do not know. A lot of people love seeing their connection numbers go up, but it really doesn’t mean anything if there’s no offline relationship. Always remember: Quality over quantity. If you must add someone you don’t know, or someone you think won’t remember you, add a note to the request explaining why the connection is necessary or where you actually met them. Do not use LinkedIn’s default add settings and do not reach out to people asking for anything other than a professional relationship. A lot of people are accomplishing amazing things and they never post about them on LinkedIn. Yeah Instagram and Twitter are great platforms for spreading the word about achievements, but LinkedIn is also a great place to do it because there’s a huge pool of professionals paying attention! Plus, you never know if your future boss, business partner, or investor is watching. Consider posting a status update about news from your 9-5, personal business, or your interests a few times each week and always ensure your posts are timely, significant, and inspiring. Record native videos that feature helpful information and post them in your status. If you have a personal blog, try cross promoting your content on LinkedIn by publishing on LinkedIn Pulse (aka LinkedIn’s long-form platform) with only the introduction to your blog. Then add a link to “Read More” that directs to your site. Also consider writing stand alone LinkedIn Pulse articles for those in your professional realm. A snapshot of how people are currently finding me on LinkedIn via keywords. 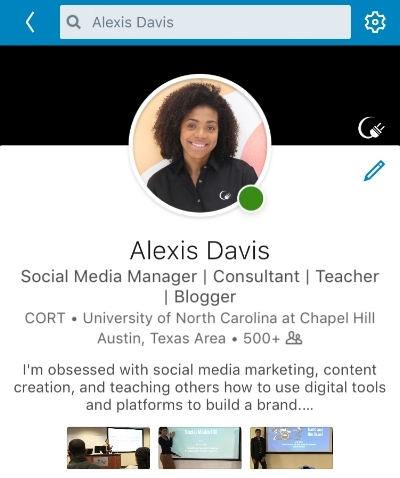 Download the LinkedIn app so you can stay connected on the go, especially at conferences. Be careful with what you like and share as other connections can see this activity. Do not recommend or endorse people you don’t know or have never worked with. Avoid discussing politics, religion, or negative feelings about your current role. Find LinkedIn Groups related to your niche and be sure to introduce yourself once you join! What do you like about LinkedIn? Do you find the site helpful? Let me know in the comments. P.S. - An older version of this blog first appeared on my Medium account.